The Recreation Center is a two-storied brick building with a red tiled hipped roof. Underneath the projecting eaves are massive curving bungalow-like brackets and exposed rafters, wood frame casement windows with transoms, and "Chicago" frame windows. 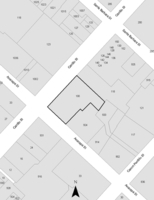 The building creates two courtyard-like spaces: one fronting Carrillo St and one between the back of the Lobero Building and the Recreation Center. The Gymnasium is a two-storied concrete structure in the Spanish Colonial Revival style. An implied diagonal is created by placement of a circular window at one corner of the building and a pair of simple rectangular windows in the other corner. The tops of the walls above roof level have a coping of tiles, and the windows are the metal factory sash awning type. Designated City of Santa Barbara Landmark (07/20/1993). 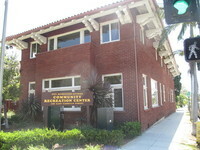 The Recreation Center was built by the Neighborhood House Association, a philanthropic organization in existence (originally as the Young People's Club Association ) since 1903. The Association was dedicated to recreational activities for children and to support for the poor. In 1913, the Recreation Center, designed by J Corbley Pool, was built in Craftsman-Prairie School style and featured a dance floor with metal springs beneath the floor. The Center was built as a recreational facility in addition to an educational facility and boarding room for single women. The earthquake of 1925 severely damaged the existing gymnasium, and so Julia Morgan was commissioned to design a replacement in the Spanish and Mediterranean style for which she was known. The Gymnasium opened in 1927, and was considered to be one of the finest gymnasiums in the nation. A) Its character, interest, and value as a significant part of the heritage of the City because the Recreation Center has been providing Santa Barbara with key social, recreational, and aid services since its construction in 1913. 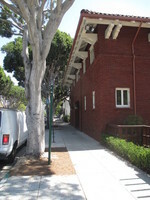 The building and its services have been supported and patroned by illustrious members of the Santa Barbara and Californa communities (such as Margaret Baylor, Julia Morgan, and Ellen Chamberlain), only adding to the Recreation Center's value as a part of Santa Barbara's heritage. C) Its identification with persons who significantly contributed to the culture and the development of the City, pertaining to social history, adult and youth recreation and architecture. D) Its exemplification of particular architectural styles and a way of life important to the City and the State: use as a community center for the well-being of citizens in two buildings, a Craftsman-derived main building and a Spanish Colonial Revival gymnasium. F) Its identification as the creation, work, and design of persons whose effort has significantly influenced the heritage of the City (Margaret Baylor and J. Corbley Pool), and the State (Julia Morgan). G. Its embodiment of elements demonstrating outsanding attention to architectural design, detail, materials and craftsmanship. I. Its unique location and singular physical characteristic representing an established and familiar visual feature of a neighborhood which inclues the Buenaventura Pico Adobe and the Lobero Theater (City Landmarks) and the Lobero Building (formerly the Margaret Baylor Inn).